Site designed and currently maintained by Becky Sherman, The Squire Farm, Chapel Lawn. C hapel Lawn is a small community within the Redlake Valley, some 3 miles south of Clun in South Shropshire. The village lies in an Area of Outstanding Natural Beauty bounded to the north by Bryneddin Wood, an ancient deciduous wood containing extensive plantings of Sessile Oak. On Caer Caradoc, a 403 metre high hill less than 1 kilometre south of the village, can be found an Iron Age Fort with mounds and ditches well defined and maintained by English Heritage. St Mary's Church in the centre of Chapel Lawn was designed by Edward Haycock in the lancet style and erected in 1844. It was planned to provide 232 sittings, of which 162 were declared free and un-appropriated forever. 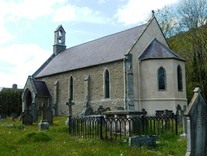 Originally a Chapel of Ease of Clun parish, without an adjoining vicarage and resident priest, it was built to save parishioners the long walk to Clun. Built of stone in the style of the period, it displays the typical plain lancets, flat buttresses, and western bell gable with a wide queen post roof. The polygonal apse, which forms the chancel, is unusual. The church became a parish church in its own right in 1991, part of the benefice of Bucknell and in January 2012, became one of seven churches in the new Middle Marches benefice. Services are held every 1st and 3rd Sunday of each month at 9.30 am. A local conservation spot, Hodre Pond, lies along the road to Obley, some 1.5 kms from the village centre and dates back some 400 years. The pond boasts many aquatic species of flora and fauna well worthy of viewing. Many public footpaths cross the Redlake Valley enabling walkers to see the the features mentioned above. Walkers are free to leave their cars at the Village Hall car park (next to the Church) whilst enjoying the local sights. Numerous sheep and cattle graze on the higher fields and walkers are asked to obey the countryside code, closing gates after themselves and keeping dogs under control. With effect from the 1st December 2013 no charge will be made for hall hire for events that are open to members of the local community. There have been reports of loose dogs attacking and killing lambs in the area. Visitors to Chapel Lawn should always keep their dogs on a lead and well away from livestock and farms, where chickens and other poultry are often wandering loose. Please respect the countryside and those who live here.